“So stupid”, a rueful self-j’accuse, demands attention from the outset. Small details follow – “the old house”, “four stubby pencils” – that bring the reader up to speed with the narrator’s life, as if she were an acquaintance we’d not seen in a while but know well enough that these throwaway references are all the information we need. Line five fizzes, the double meaning of “old scores, settled” landing with real weight. The second stanza, in just fifteen words, pulls off a taut comparison between the narrator and the ‘new lover’: she’s pragmatic, self-aware; he’s gauche, awkward, trying too hard. Stanza three delivers a bluntly effective pay-off, Alma making two reclaims from male vernacular. Look at “score” – in laddish colloquy, a reference to a sexual conquest – and how Alma follows it with “only” and consolidates it, two lines later, with “another time”. It’s clear that the wannabe Lothario isn’t going to score – not in this poem, anyway. Then look at “V”, a single letter positively loaded with toxic masculinity, from Churchillian V for Victory swagger to its use as a truncation of ‘versus’: a letter redolent of taking sides, squaring off against an antagonist, fighting. Not to mention its calling to mind of Tony Harrison’s book-length poem, itself a pressure cooker of political protest, unionism and the class war. Do you eat the shells of eggs asked the terrapin? I am gentle and leave it alone. There’s a lot going on here, but Alma’s rephrasing of Tennyson’s famous line from ‘In Memoriam A.H.H.’ leaps out immediately. The familiarity of “red in tooth and claw” is what Alma banks on to make the homophonic substitution of “truths” for “tooth” work so well. Her reclaiming of Stephen Crane’s ‘In the Desert’ (“It is bitter – bitter … // “But I like it / “Because it is bitter / “And because it is my heart”) is subtler, sneakier and achieved with panache. struck me as a reclaiming of James Dickey’s technically impressive but quasi-pornographic ‘Falling’ (the one about the air hostess denuded by the slipstream as she falls to her death), but whereas Dickey’s fantasia sprawls out across five pages, Alma’s slap down occupies all of ten lines. It would be remiss of me, though, to suggest that these reclaimings are the aesthetic raison d’être of the collection. 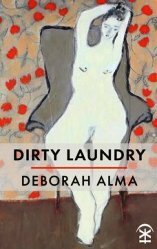 For all that Alma conjures connections (and correctives) to other work, the chief pleasure of Dirty Laundry is to experience the arrival of a feisty, intelligent and defiant voice that is entirely the poet’s own. A voice, moreover, that is unafraid to tackle thorny subjects, sometimes satirically (the sexual hypocrisy of the Catholic Church is rendered as a walk-through of preserved pontifical penises in ‘The Head of the Church in Rome’), sometimes with unflinching directness (‘Chicken’, one of the shortest pieces in the book, is a stark distillation of abusive relationships), and sometimes with such gossamer-light sensitivity that the reader realises that to have taken any other approach would have seen the poem implode under its own weight. The red of the rose evoking the red rosette Cox wore as a Labour MP is Alma’s only political reference; the thrust of the poem is its quietness, its communication of loss by means of a via negativa. Leading off the collection with it was a gambit: in many ways, it’s not indicative of Dirty Laundry’s bolshy, ballsy commitment to exist on its own terms. ‘Flock’ is quiet, mournful, suffused with regret. But that’s why the gambit pays off: once the needless death of a woman whose commitment to social betterment has been recorded and reflected on, Dirty Laundry rolls up its sleeves and gets on with the business at hand: taking back language, narrative, scenarios and experiences from the kind of patriarchal blowhards who would doubtless yawp and bluster and cry foul to see themselves reflected in these pages.